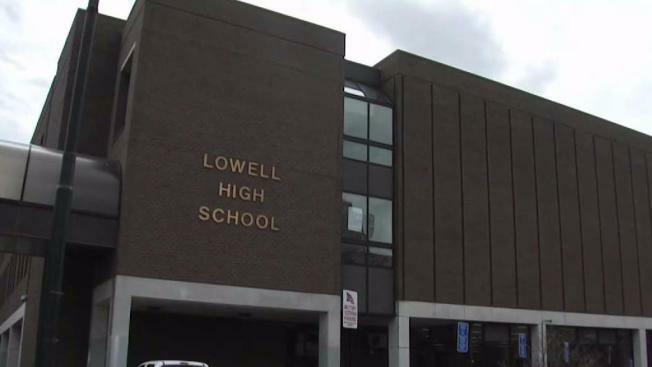 As the temperatures rise outside, students and parents say they are also soaring inside Lowell High School. The problems at the Massachusetts school have been piling up after a series of gas issues caused the school to be closed for several days last month, and parents say the arrival of warmer weather is raising even more concerns. Students said it is so hot inside, they cannot stand it, but they also cannot believe it, given that they complained they were freezing in the same classrooms during the winter months. They said the sweltering conditions are in not all, but many, of the classrooms. "Everyone's sweating," sophomore Danielle Larned said. "They're really hot. They're using their papers to fan themselves and they can't focus." Students said some of their teachers have purchased their own portable air conditioners. A picture of one showed the temperature surpassing 80 degrees. Students also said vents that were not blowing hot air in the winter seem to be blowing hot air now. "There's no balance," junior Evelyn Lally said. "It's super hot or super cold. There's no in between." The overheating is just the latest outrage for parents who said they are a fuming over all of the disruptions. Last month, several gas leaks in the field house forced the school to shut down for three days. As a result, the city is spending roughly a quarter of a million dollars to replace part of the heating system, but that process will take weeks. A full renovation and expansion of the school, which the school building committee recently voted on, is not expected to be complete for several years. As students wait, parents said they will not be able to cool off until there is a permanent fix. "The kids and teachers [are] in an absolute oppressive situation," parent Lauren Szafrin said. "I wouldn't want to sit in a classroom if it was 85 degrees all day. We need a solution now." School and city officials did not respond to NBC10 Boston's request for comment on this issue.